Who is going to play right wing with Johnny? Get used to the question, folks, as it is quickly becoming the new version of the exhausting dilemma that hovered around Calgary for over 15 years -- who is going to play center for Jarome? There's been a lot of chatter about Jarome Iginla recently. It heated up when he tried but failed to score career goal No. 600 against the Flames last Saturday. The buzz continued when he did become the 19th NHL player to score that milestone goal in Colorado's next game against the Los Angeles Kings. Last night against Nashville, Iginla notched No. 601 to pull even with Jari Kurri for 18th all-time. What if he had a chance to play the 2004-05 season? He scored 41 goals the season prior. How many goals did he miss out on because of the year-long lockout? What if he played a full 82 games in the lock-out shortened 2012-13 season? He had 14 goals in 44 games, which had him on a pace for 25 over a full season. However, perhaps the biggest 'what if' when it comes to the Flames old No. 12 is what if he actually had a superstar centre to play with during his time in Calgary? Oh, they weren't all the ilk of Jeff Shantz, thankfully. But if you look back at the other centres Iginla had over his years wearing the flaming 'C', it's not exactly a who's who of perennial NHL all-stars. Cory Stillman, Marc Savard, Craig Conroy, Daymond Langkow, Olli Jokinen, and those are the best of the bunch. There were many other failed experiments along the way. Ironically, after a decade-and-a-half of having a top line right wing but not much else around him, that same position is now the Flames most glaring hole and it's not even close. Sure, the goalie situation with no established NHL goalie under contract beyond this season is also a short-term concern, but at least the team does have highly-touted prospects in the pipeline in Jon Gillies and Mason McDonald. Things don't look nearly as promising at right wing. Johnny Gaudreau has been in the NHL for a season and a half. During much of that time, his centre has been Sean Monahan and despite Monahan's play dropping off a bit this year, centre is not the immediate concern here. Make no mistake, the question mark is the right side. Until now, his most regular right winger has been Jiri Hudler. While he shoots left, Hudler did a phenomenal job on his off wing last season with 31 goals and 76 points to finish in the top 10 in NHL scoring. But Hudler is now on injured reserve with a groin injury. The way he's played for much of what's been a disappointing season, one wonders how long the injury has hampered him. Regardless, he's out for probably a couple of weeks minimum and considering it's the type of injury you risk aggravating if you return too soon, expect a cautious approach. If Hudler is out until after the all-star game, that wouldn't surprise and then we're down to just over a month until the NHL trade deadline. As a pending unrestricted free agent on a team that probably cannot afford to re-sign him even if they wanted, one would expect the club to look at trading him. Even if Hudler does play out the season, it's hard to envision him in a Flames uniform in 2016-17. So for the purpose of this article, let's cross him off the list of possibilities and concentrate on other options to be the right winger to play with Gaudreau and Monahan. For those wondering, I'm going to assume Gaudreau and Monahan remain together indefinitely because they've been together much of Gaudreau's NHL career and the best other centre option -- Sam Bennett, is currently playing exclusively on left wing. I still expect Bennett to eventually be moved to centre and at that time could certainly become Gaudreau's pivot, but given the construction of this team with Mikael Backlund, an improved Markus Granlund and the reliable Matt Stajan entrenched up the middle, shifting Bennett to centre is not something I see as imminent as it doesn't work all that well with the current personnel. If there's one thing we've learned over the last couple weeks, it's that Joe Colborne -- a great guy and all -- is not a fit to be on the top line. Colborne is a serviceable bottom six NHL player that has decent hands for his size but far too often plays die on his stick and you can't have that from a forward playing alongside one of the most naturally-gifted offensive players in the NHL. Saturday morning as the Flames returned to work with a long, brisk practice at the Saddledome, coach Bob Hartley confirmed that indeed, it is time to try someone new alongside Gaudreau and Monahan. "I've been looking since the start of the year for the guy to play with those two guys," Hartley said. "We've had quite a few auditions and the results have not been what we've been expecting." 1. 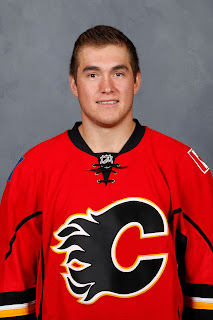 Micheal Ferland - The big man has really played well lately and has been showcasing the skill he has beyond delivering glass-rattling body checks. "The timing is right for Ferly to get his time with those two," Hartley said. "I like what Ferly brings right now. His skating, he's a force out there. Hopefully this can be the magic combination." Hartley says Ferland's presence should help create more space for his skilled linemates. "We need someone to open up some room for them. Obviously, other teams are paying a lot of attention and spending lots of time on those guys and we need a physical presence, a guy that can skate with them, a guy that can pass the puck." 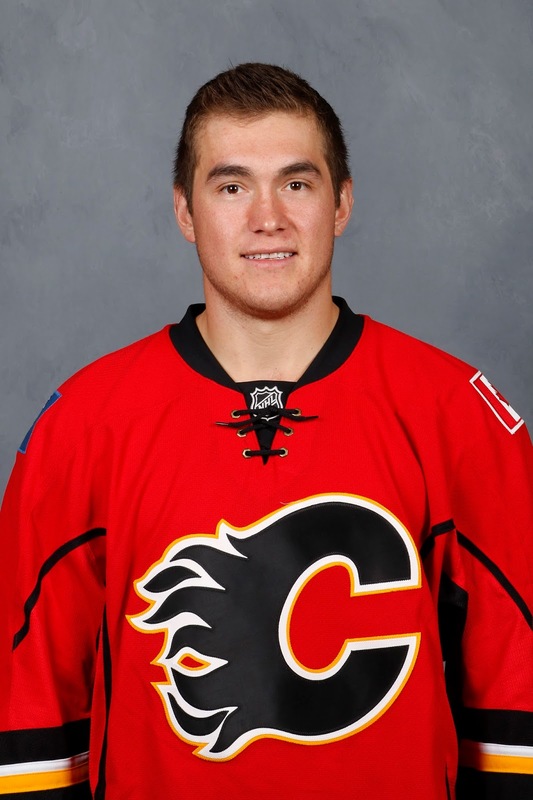 Standing 6-foot-2 and weighing 208 pounds, Ferland is a physical force but don't underestimate his skill level either. He scored 47 goals with Brandon in the WHL four years ago. Lately he has shown an ability to hold onto the puck and make plays. "When you hear about big, physical guys, you don't hear about their creativity but Ferls is a pretty skilled player too," said Gaudreau. "He'll be a good presence for us in the offensive zone, getting down low, getting pucks away from the other team's defence and he's a great screen too. We have to use that big body to our advantage." Ferland is looking forward to their first game together, which is a key divisional contest on Monday night against the San Jose Sharks. "It's a great opportunity for myself," said the 23-year-old, who amazingly is the elder statesman on the line. "The biggest thing is helping get pucks back. Be hard on the forecheck, force them to turn pucks over so I can create offence and always be ready for the puck." Here are four other short-term candidates I had identified prior to the announcement of Ferland. Who knows, maybe one of them is next in line should this latest experiment not pan out. 2. Sam Bennett - It's the trio that many are clamouring for and there's certainly an allure to seeing the future foundation at forward all on the same line. Now this would involve the left-shooting Bennett moving to right wing and it's hard to imagine he's done that much in his hockey career. But given the chance to play alongside Gaudreau and get out of his current offensive skid, I suspect the amount of arm-twisting required to get him to agree to moving to the off-wing would be minimal. 3. David Jones - Also a unrestricted free agent as season's end, they were together for an extended period in December and did enjoy modest success. Jones was not exactly racking up points himself but the other two did -- Gaudreau being named the NHL's first star for the month. He brings a similar presence that Ferland would as a big guy that has the ability to get in the corners, lay the body, win puck battles and also be a presence in front of the net with an ability to finish. 4. Josh Jooris - I don't think he has the offensive upside to be a long-term fit on the top unit but it would be worth trying Gaudreau's roommate as his linemate and seeing if they can develop some chemistry on the ice as well. Jooris brings plenty of energy and quickness and could be a nice complemenatry piece as someone to do the spadework in deep to help get the puck out to the other two. 5. Michael Frolik - Still a week or so away from being ready to come off the IR, Frolik would be someone to try given the top line is on the ice a lot and often against other team's top units. The veteran is a nice two-way fit that would help in the defensive zone yet is also someone that has decent hands and thinks the game well, even though his shot may not be the most dangerous. Long term, I see Frolik as more of a second or third line winger but with how thin the position is, first line is a very real possibility in the short term. I'm convinced that TJ Brodie is actually the #Flames best right wing option -- and that would be while still playing defence, of course. I joke about Brodie at right wing but seriously, it really is a woefully thin position for this organization. When minor league journeymen and natural centres like Derek Grant and Drew Shore are your best call-up options at right wing, you know it's a position badly in need of being addressed. Rugged Garnet Hathaway could very well be an NHLer someday but he'll never play on the top line. Austin Carroll and Hunter Smith are natural right wingers playing with the Heat right now but are a long, long way from being NHL-ready and that's if they ever get there. They're also not projected to be top line players. Looking big picture, here are three best long-term options at right wing as of right now and given two aren't even part of the organization, the concern is real. 1. Kyle Okposo - Currently with the New York Islanders, the seventh overall pick in 2006 is the best of the pending unrestricted free agents at right wing this summer. Okposo, who also shoots right -- a rarity among the Flames current right wing candidates, is also the ideal age as he will be 28 in April. If he makes it to the open market on July 1, this would be a player for general manager Brad Treliving to aggressively pursue as he has the overall package to be a top line fixture with Gaudreau for many years. 2. Emile Poirier - The second of the Flames three first round picks in 2003, Poirier's stock has dropped some after a disappointing training camp and start to the year in the AHL. Now at age 21, he's still very much in the organization's plans and this could very well be just a blip but to assume he'll be in the NHL playing on Calgary's No. 1 line anytime soon would be reckless planning. At this point, you let him develop in Stockton, hope he finds consistency and is able to finish strong this season and bounces back next fall. If he pushes for that top line winger role at some point and there's someone already there whom the team brought in, those are good problems to have. 3. Jesse Puljujärvi - The hulking 6-foot-3 17-year-old was one of two similar-sized right-shooting wingers on that Finnish World Junior team that won gold this week. The other was Patrik Laine. Considered to be a top three pick in the 2016 NHL Draft -- a year in which the top three picks will all be determined via lottery -- he'd be an absolutely perfect fit for this organization. Treliving was in Finland to watch the World Juniors and he was impressed by the two Finns. I ran into him at the Saddledome the day he got back and he quipped that he wished he could have smuggled them both back to Calgary in his luggage! For now, it's Ferland and we'll see how he fares. However, with every game being so important in the tight Pacific Division, the revolving door isn't that far away. Gaudreau has an elite skill set and while you'd think that makes it easy for many players to play with him, that's not necessarily the case. In addition to finding a player to play with Gaudreau, you're also looking for a player Gaudreau can thrive with. The 22-year-old is an elite player and you don't want his talent squandered by surrounding him with players that can't bring out his best. Again, one thinks back to Iginla and all those years of trying and failing to find him an elite centre to play with. Years with one of the best players in the NHL that many fans view as a wasted opportunity for the club to add to its one Stanley Cup win. One thing for certain, expect right wing to be the focal point for Treliving this summer and whether it's via the draft, free agent signings, trades or all of the above, expect an influx of right wing candidates to enter the organization in the next eight months. If only Iginla was 15 years younger. By the way, have you liked Flames From 80 Feet on Facebook yet? Go there and do so now. It's just another way to be alerted to new Calgary Flames articles that I've written. Eight From 80 Feet: Eight Random Thoughts as 2016 Gets Underway - Topics include a better-than-you think PK, Andrew Mangiapane's lofty company, what to do with Jiri Hudler, Karri Ramo's resurgence and an easy upcoming schedule. (January 3, 2016).